Iteratively develop code in containers using Visual Studio 2017. Debug code running in your cluster using Visual Studio 2017. Visual Studio 2017 on Windows with the Web Development workload installed. If you don't have it installed, download it here. Visual Studio Tools for Kubernetes installed. Select + Create a resource > Kubernetes Service. Enter the Subscription, Resource Group, Kubernetes cluster name, Region, Kubernetes version, and DNS name prefix. 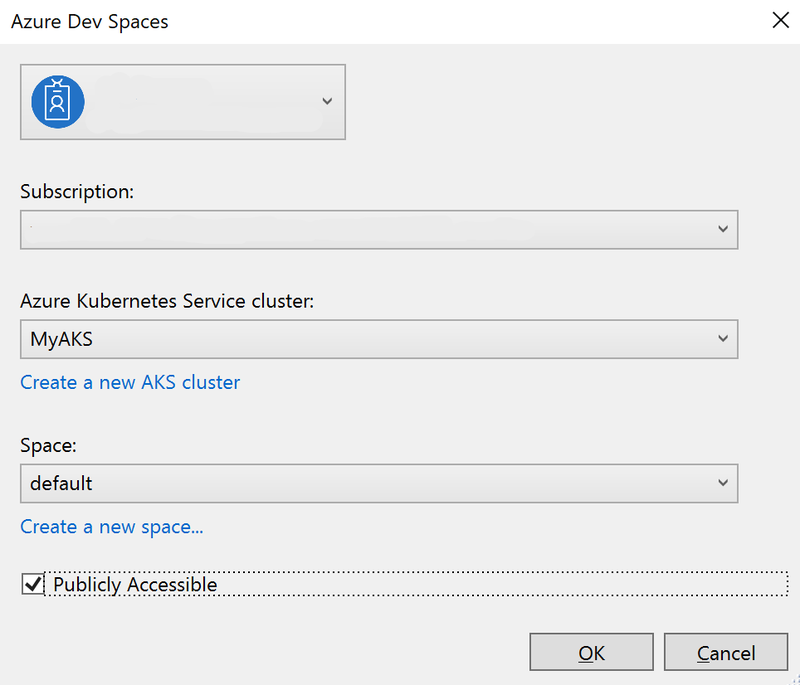 Navigate to your AKS cluster in the Azure portal and click Dev Spaces. Change Enable Dev Spaces to Yes and click Save. Choose ASP.NET Core Web Application and name your project webfrontend. When prompted, choose Web Application (Model-View-Controller) for the template. Select .NET Core and ASP.NET Core 2.0 at the top. In your project, select Azure Dev Spaces from the launch settings dropdown as shown below. 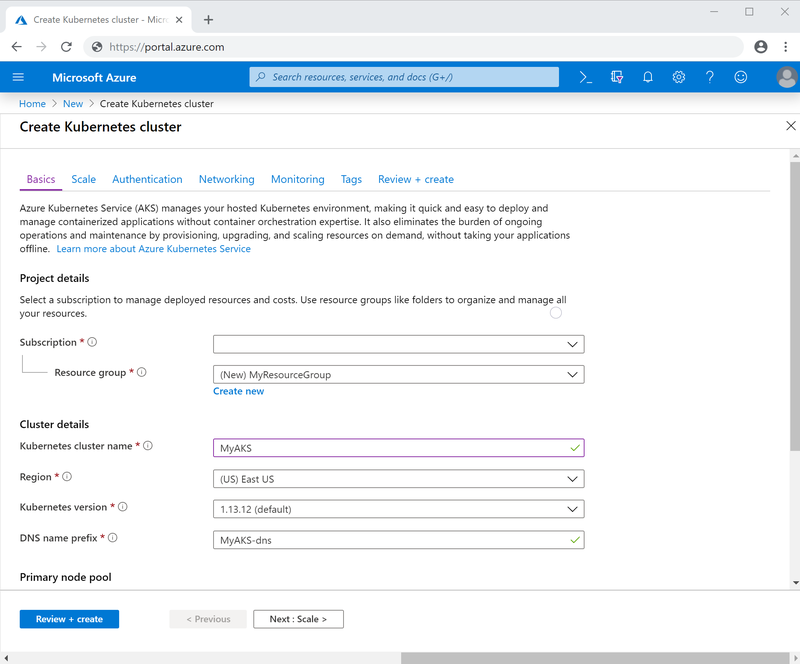 In the Azure Dev Spaces dialog, select your Subscription and Azure Kubernetes Cluster. Leave Space set to default and enable the Publicly Accessible checkbox. Click OK. This process deploys your service to the default dev space with a publicly accessible URL. If you choose a cluster that hasn't been configured to work with Azure Dev Spaces, you'll see a message asking if you want to configure it. Click OK. In the above example, the public URL is http://webfrontend.1234567890abcdef1234.eus.azds.io/. Navigate to your service's public URL and interact with the service running in your dev space. 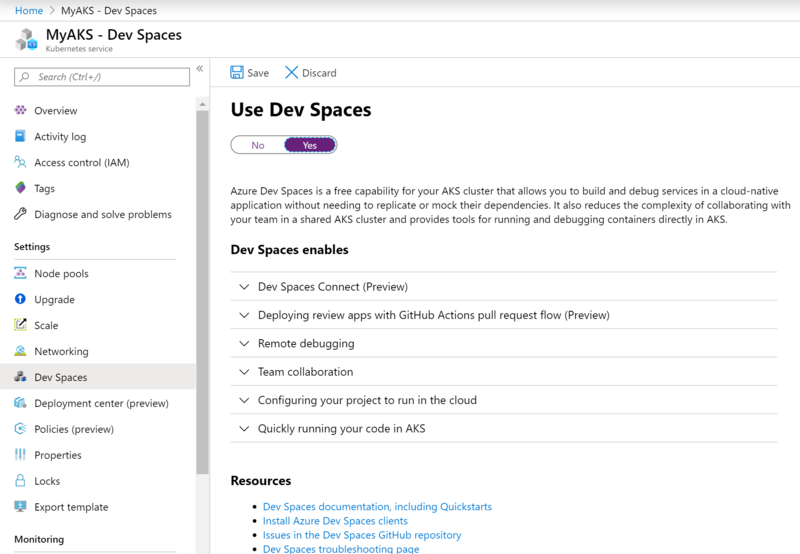 Save your changes and start your service using Azure Dev Spaces from the launch settings dropdown. Open the public URL of your service in a browser and click About. Observe that your updated message appears. If Visual Studio 2017 is still connected to your dev space, click the stop button. Open Controllers/HomeController.cs and click somewhere on line 20 to put your cursor there. To set a breakpoint hit F9 or click Debug then Toggle Breakpoint. To start your service in debugging mode in your dev space, hit F5 or click Debug then Start Debugging. Open your service in a browser and notice no message is displayed. Return to Visual Studio 2017 and observe line 20 is highlighted. The breakpoint you set has paused the service at line 20. To resume the service, hit F5 or click Debug then Continue. Return to your browser and notice the message is now displayed. Remove the breakpoint by putting your cursor on line 20 in Controllers/HomeController.cs and hitting F9.